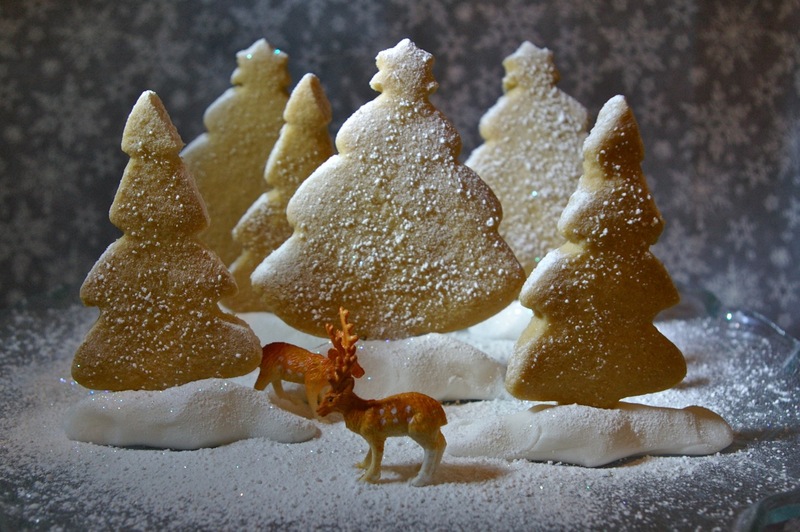 and the Christmas making continues – Deerey Me! 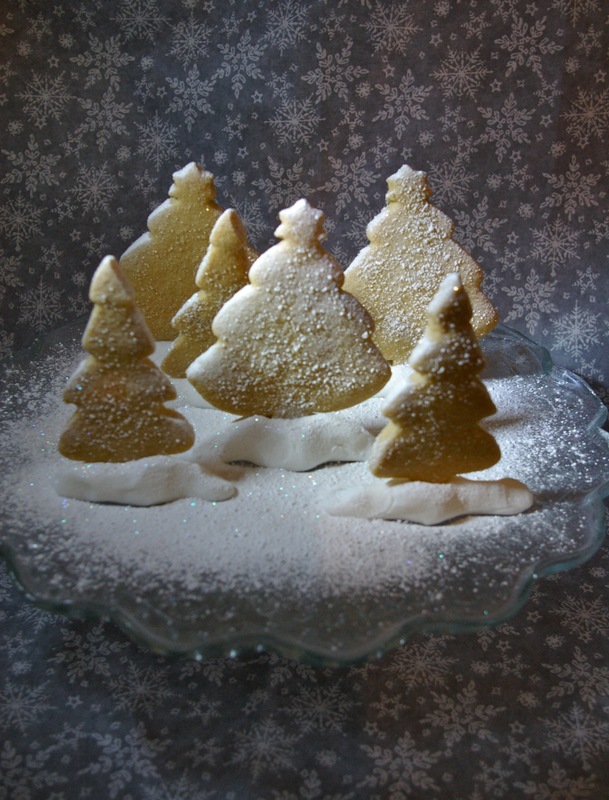 Well, my time continues to be ploughed in to making for the Christmas fair on 4 December – I rarely have time to write much, which I miss. I also suspect that just bunging a load of photos in to my blog is not only a cop out, but makes entries less interesting. Of course I may be wrong and readers may be relieved when they see I have refrained from wittering on. I am trying to fit in a bit more non-business stuff. This week I made 12 jars of dumpsideary jam (spiced apple, pear and plum) from Gloria Nicol’s book ‘Fruits of the Earth‘ and shortbread Christmas trees to photograph for Christmas cards from uk.Moo.com and four Christmas cakes to be fed weekly with brandy. What’s more Mark and I went out for lunch today – just the two of us (and he bought me flowers on Friday…should I be worried?). Tomorrow afternoon I am giving blood , so that too will be a non-business activity. 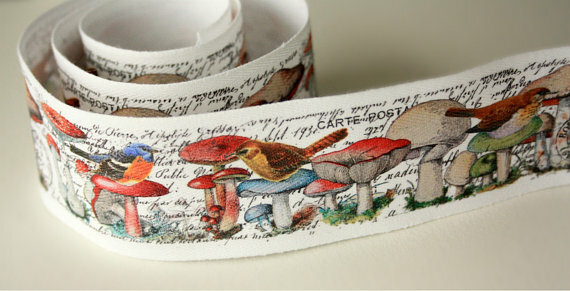 I also signed up for an artist trading card (ATC) swap run by Ali at very berry handmade. I confess that although I had seen the size of the card, it had not sunk in just how small it actually is. 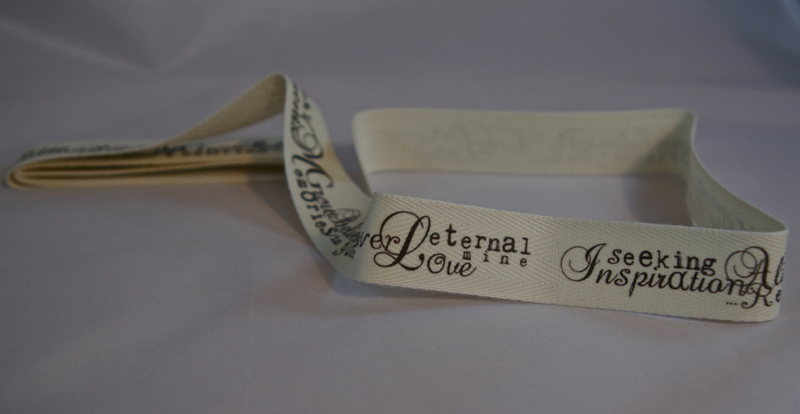 The finished card sits easily in the palm of my hand – and that makes cutting out all those leaves exceedingly fiddly. 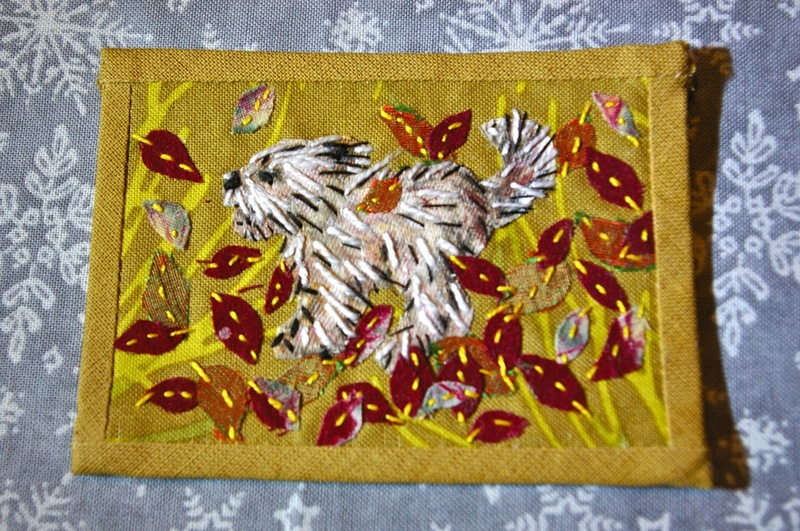 I worked out the design on paper and then painted the dog in fabric paint on natural calico, then used a temporary spray adhesive to hold it in place on the background fabric and ironed on some stitch and tear to stabilise the fabric while I stitched on the leaves and highlighted the dog’s fur in black and white, adding a French knot nose. I made a backing and cut down some bias binding for the edging. It goes in the post tomorrow and I am a little sad to see it go, but I am excited to see what I receive in the post in return! 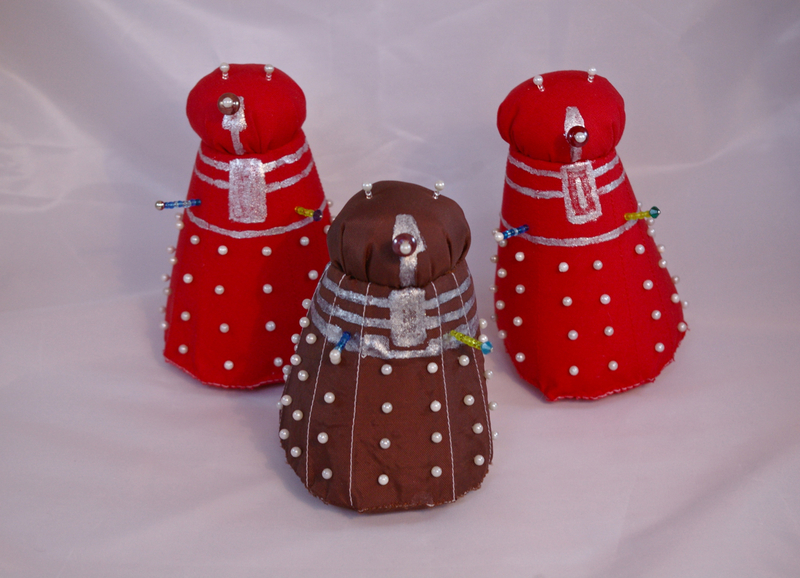 On the business side, I have had orders for dalek pincushions and will be making still more this week. 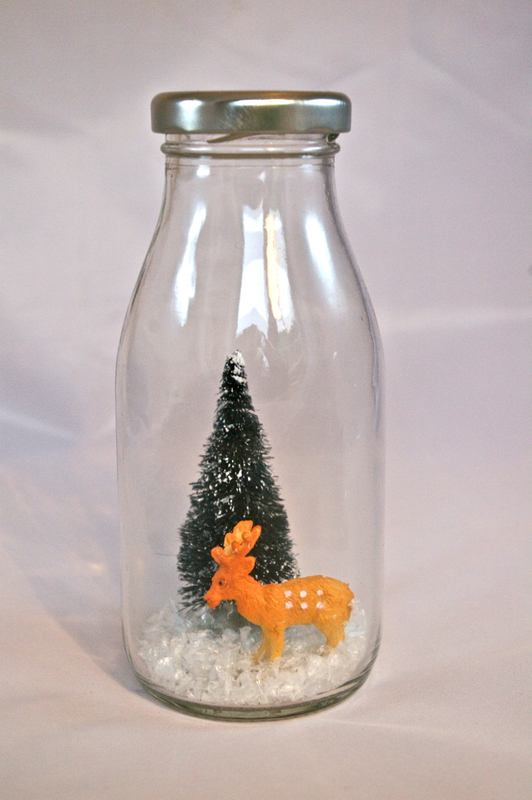 I found some old fashioned milk bottles in Lakeland and am very happy with the look of the snow scenes (not edible!) I have made in them – what do you think? I am running out of space in our dining room/my work room for snow scenes, but am reluctant to fill the living room with them as I don’t want us to get bored of Christmas before it has even started. I generally refuse to put up the tree or any decorations (other than the wooden advent train) more than a week before Christmas, so really hope these things sell! I decided though that I don’t want someone else’s image of a fairy tale, as I want to use my own images, so opted for this one. 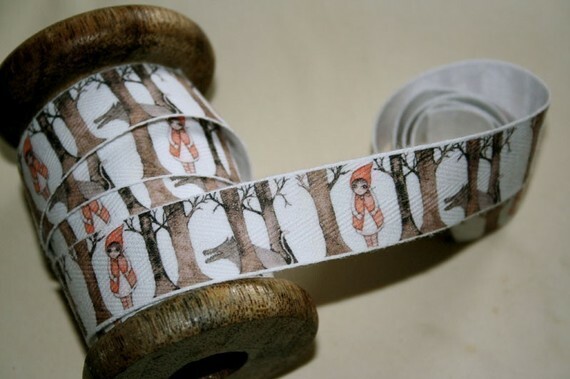 If you are tempted to buy yourself some of these printed tapes, you will need to get a wriggle on as Lilla Lotta’s Etsy shop says she will be closed for at least a year from January! Right then, now I have done a wee bit of writing, i want to do some reading…Vastgotaspets och tradgard, Knitsofacto and Twigg Studios, here I come! Well, much as I love your photos, I do love your witterings… so please witter on! And, did you know that your blog is very educational? I had not idea what a “dalek” is, but good old wikipedia came to my help. I can well understand that you have loads of work to do before Christmas -but I just wanted to sayt that I am very happy to read your blog posts. Well I was very happy to see the card arrive! I promise it will be loved around here!